Information for Bow of Slaughter, a usable item in Arena of Valor (AoV). Included are its effects, unique passives and/or actives, price, and item tree. We also measure effect ranges, explain any ambiguous effects, and give our recommendations on how to use the item. Unique Passive(s) Bloodthirst: Increases Life Steal by 90% for 3 seconds. 60-second cooldown. 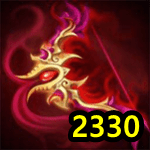 Only usable by ranged heroes. Bow of Slaughter, introduced in patch 14, is the first to offer both life steal and critical chance in the same item. It is also only the second item to increase critical chance while also providing an attack damage boost. Further, the Bloodthirst active is an incredible tool for marksmen – particularly immobile marksmen – to sustain themselves after getting jumped. In fact, it nearly eliminates the need for other life steal items like The Beast or Omni Arms, freeing up crit-building marksmen for items like Frost Cape, which provides utility and defense. Put it all together, and Bow of Slaughter is nearly a must-pick for marksmen utilizing a critical chance-based build. Almost all in the marksman class who rely on their auto attacks will greatly benefit from this item. Marksmen without a built-in escape such as Yorn, Valhein, and Tel’Annas are easy choices for Bow of Slaughter because Bloodthirst is a great panic button when jumped on. Bruisers can combine Bow of Slaughter with Slikk’s Sting for the life steal and resistance along with the substantial damage boost, even without Bloodthirst.